You can find former members of the Hodge Institute on our Alumni page. Sir Michael passed away on the 11th of January 2019 aged 89. He had been honorary professor at the University of Edinburgh since 1997. He was a great mathematician whose work will continue to influence scientists, far in to the future. To us in Edinburgh he was a tremendous colleague, to the community of mathematicians and physicists he was an inspiration, and to people all across the world he was a wonderful friend. The Atiyah 80+ website has a wealth of material about Sir Michael, including an interview. I am interested in the connections between homotopy theory and arithmetic. In the past this meant thinking about algebraic K-theory. These days, I'm more interested in étale homotopy types and related invariants. I have been working on questions in algebraic geometry motivated by string theory and mirror symmetry; for a while that meant Gromov-Witten theory, in the last few years mostly derived categories and stability conditions. Recently that has led me to very classical questions in algebraic geometry, via wall-crossing and birational geometry of moduli spaces. I work on applications of refined and categorified Donaldson-Thomas theory. This includes work in cluster algebras, quantum groups, nonabelian Hodge theory and enumerative geometry of 3-Calabi-Yau varieties and noncommutative varieties. I am interested in Lie theoretic representation theory and its connections with combinatorics, geometry and noncommutative things. You can find my papers on the arXiv, Google Scholar, MathSciNet, or my homepage. Not everything is on the arXiv. I am working on algebraic geometry, commutative algebra, and combinatorics. My interests include positivity properties of line bundles and syzygies, toric varieties, and tropical varieties. I study various algebraic systems which lie between representation theory and physics. More precisely, my research falls roughly into three distinct areas: firstly, I study tensor categories in their various flavors (fusion, braided, symmetric, stable oo-…) - their classification, and their representation theory. Secondly, I study the interplay between non-commutative algebra and algebraic geometry. Finally, I study quantization problems involving quantum groups, quantum orbit spaces, and their geometry. You can find my papers on the ArXiv. Most of what I do is about category theory and its many applications, including some nonstandard ones such as geometric measure and aspects of both analysis and theoretical ecology. They are loosely unified by the themes of size and measurement. I am one of the hosts of the n-Category Café, a research blog where I have written about many of my interests. My papers, talks and blog entries can all be found through my home page. I am interested in noncommutative algebra, in particular in growth of algebras and quantum algebras. I'm also interested in totally nonnegative matrices. Click on my name to reach my webpage where publications are listed. My primary interests are in moduli spaces of objects in the derived category of sheaves on low dimensional algebraic varieties, especially Calabi-Yau varieties and more especially abelian and K3 surfaces. I am also interested in triangulated categories and hyperkahler geometry more generally. I am especially fond of the Fourier-Mukai transform as a means to understand the detailed structure of varieties and their moduli spaces of sheaves. See arxiv for a list of papers. I study algebro-geometric and symplectic structures of various moduli spaces, mostly with links to physics (gauge theory, conformal field theory, integrable systems). Liam passed away on the 25th of October 2017 aged 72. He was a wonderful colleague, a great mentor to many of us in the Hodge Institute, and an excellent mathematician. You can find details of his papers on google scholar and on MathSciNet. I work in symplectic geometry, in particular using hamiltonian actions and moment maps. My work on degenerate symplectic structures — origami manifolds and b-symplectic or log-symplectic manifolds — led me to connections with toric topology, contact geometry, and Poisson geometry. More recently I have become interested in quantitative symplectic geometry by woking on symplectic embedding problems. I work on applications of abstract homotopy theory to algebraic geometry. My research has two main strands: derived algebraic geometry, and homotopy theory of algebraic varieties (including arithmetic and motivic aspects). You can find my papers on the arXiv or my homepage. Andrew passed away on the 20th of February 2018 aged 69. He had an extraordinary appreciation of people and was a remarkable colleague. To find out more, please go to http://www.maths.ed.ac.uk/~v1ranick/. I work on homological mirror symmetry and symplectic topology. My papers are available on my webpage. I am a noncommutative ring theorist, specialising in interactions between ring theory and algebraic geometry, particularly the use of geometric techniques to solve problems in algebra. I am particularly interested in birationally commutative algebras (graded algebras that embed in a skew polynomial extension over a commutative ring) and in graded domains of low GK-dimension. Much of my research is motivated by the attempt to classify connected graded domains of GK-dimension 3. I am also interested in moduli problems for graded rings and in algebraic geometry, and recently I have begun to work on problems coming from Lie theory. My papers are available on my webpage. I am interested in noncommutative algebra. You can see my publications on MathSciNet. I am a number theorist. We have also several faculty in neighbouring fields with strong interest in geometry, including Harry Braden, José Figueroa-O'Farrill, James Lucietti and Joan Simon in the Edinburgh Mathematical Physics group. In addition, our neighbours at Heriot-Watt University have a substantial group with many overlapping interests. My research is in representation theory, with a special focus on the interplay between algebra, geometry and combinatorics in quantum groups. I am interested in infinite-dimensional Lie algebras, quantum groups and braid groups, quantization and deformation theory, integrable systems, and categorification. My research is in algebraic geometry, in particular applications of the theory of stability conditions and derived categories to the enumerative geometry of curves on Calabi-Yau threefolds, such as Donaldson-Thomas, Pandharipande-Thomas, and BPS invariants. At the moment, I am interested in their underlying motivic and categorical refinements. My research interests are deformation theory, moduli problems and enumerative invariants arising from them. In particular I am interested in Gromov-Witten and Donaldson-Thomas type invariants and relations among them. My research is centered around Geometric Representation Theory. I study things like D-modules on reductive groups and associated moduli spaces using tools from topological field theory and derived algebraic geometry. I am interested in noncommutative algebra and its interplay with (noncommutative) geometry, representation theory, operads, homological algebra, K-theory. The structures originated in physics, topology, geometry, such as Calabi-Yau algebras, Novikov algebras, operads of CFT, etc. are of particular interest. My papers are available at ArXiv. My research focuses on algebro-geometric and tropical aspects of mirror symmetry and enumerative geometry, with a particular focus on cluster varieties. I am especially interested in how canonical bases of regular functions on one cluster variety are related to counts of algebraic curves (log Gromov-Witten invariants) in the mirror cluster variety. I am also interested in quantum and motivic refinements of this correspondence. My research revolves around integrable systems, geometric representation theory, character varieties, quantum groups, and cluster algebra. I am a PhD student working with Michael Wemyss. I'm a PhD student of Jon Pridham, interested in algebraic geometry, algebraic topology and homological algebra. I am a PhD student of Johan Martens as of September 2018. My research interests are in the interactions between algebraic, complex and symplectic geometry, with an occasional foray into mathematical physics. I am a PhD student of Andrew Ranicki, interested in the topology of manifolds. 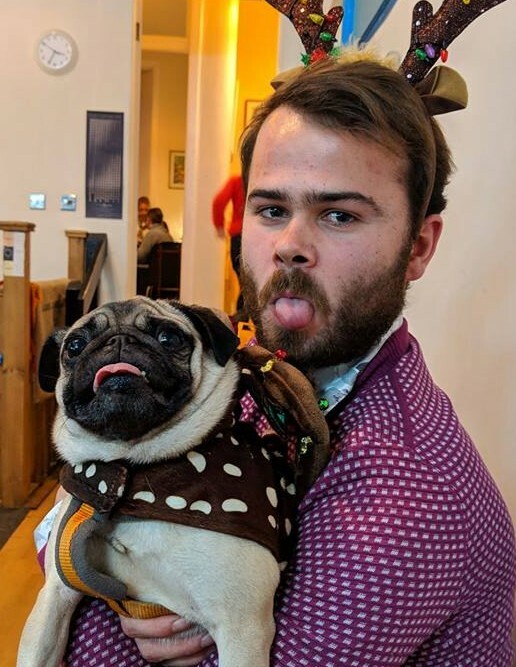 I am a PhD student of Ben Davison in Edinburgh since 2018. I'm interested in algebraic geometry. I am a PhD student working with David Jordan. I am a PhD student working with Sue Sierra. I began as a PhD student at Edinburgh in September 2018, and my advisor is Milena Hering. I'm a PhD student working with Arend Bayer. I'm a PhD student working with Tom Leinster. I'm a PhD student working with David Jordan. I'm interested in representation theory and geometry, and areas where the two collide e.g. quantum groups at roots of unity.